Entertainment, Lifestyle, Fashion & Celebrity Gossip. Sweet Delicious tea, served to you all, piping hot ☕️��️ All the comments on this blog are the personal opinions of those who have sent them (commentators). We take no liability whatsoever on those comments. Twitter handle @maestrolifestyl. 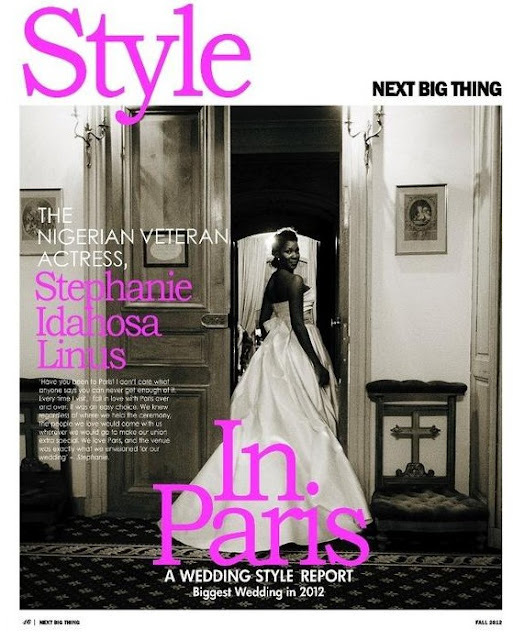 The reverberations about Stephanie's spectacular May 2012 Paris wedding is still going on. The very romantic wedding was featured in the recent edition of a top magazine in Canada called the ''NEXT BIG THING''. The beautiful cover has our very delectable Nollywood veteran in her glorious wedding outfit, looking angelic. The splendid picture was in vintage black & white. The feature was titled one of the biggest Parisian weddings of 2012. Wow! It must have been that BIG then. WHO IN THE WORLD IS THE FAMOUS KIKA? Its a complete lifestyle blog with a difference, clear and outstanding pictures that says a lot,and coverage of events that others might not have access to. CHECK OUT THE RESURGENT TERRY G, see Groove! TOOLZ THE BODY- MAD HOT DELICIOUS CANDY!!! SOLANGE KNOWLES ROCKS BABATUNDE CAP HOT OR NOT? KIM K- HOT OR NOT? MICHELLE OBAMA IN 3 WORDS! HELLO KAREN! HOW DO YOU DO? THIS SHIP IS SINKING,YES-SO WHAT DO WE DO?